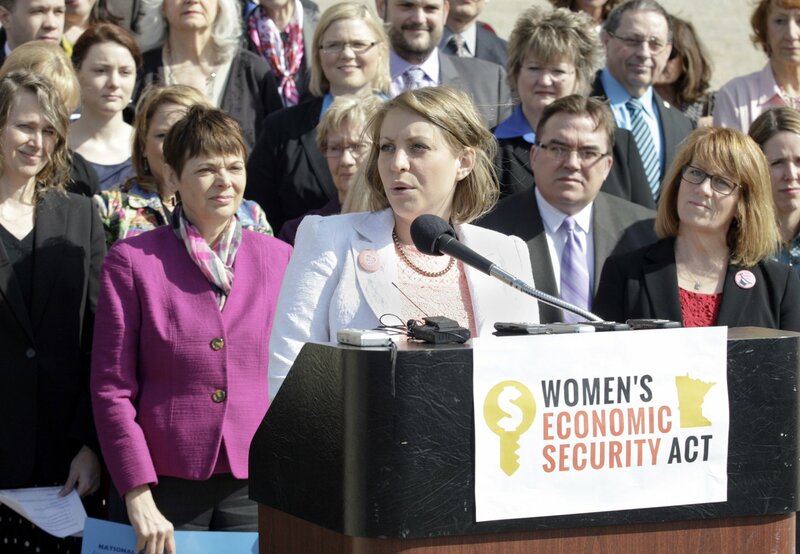 After nearly four hours of debate Wednesday, the House passed the so-called “Women’s Economic Security Act” on a 106-24 vote. Also known as WESA, one of many things the bill would provide are ways to bring women into higher wage, higher-impact careers, or jobs that are dubbed “traditionally male.” HF2536 now moves to the Senate where it is sponsored by Senate President Sandy Pappas (DFL-St. Paul). This bill has seen many supporters throughout the session, but also opposition from those who say the bill moves women backward by assuming that women can’t take care of themselves and need the government to assist them. During the House Floor debate, Rep. Sarah Anderson (R-Plymouth) offered a delete-all amendment to the bill that was voted down, but said it’s up to women to make things happen for themselves. Rep. Carly Melin, left, responds to a question from Rep. Peggy Scott during debate on HF2536, the so-called “Women’s Economic Security Act” April 9. Rep. Tim Mahoney (DFL-St. Paul), chairman of the House Jobs and Economic Development Finance and Policy Committee, talked about many of the provisions of the bill that were vetted in his committee. enhancing retirement security by studying the potential of a state retirement savings plan for those without an employer-provided option.